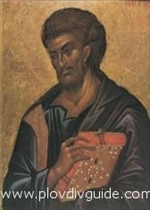 St.Luke, Holy Apostle and Evangelist, who wrote about the life of Jesus, used to be a good healer and a talented artist. He was born in the Syrian town of Antioche. After his meeting St Paul, he decided to dedicate his whole life in service to God. Luke had the fame of an eminent healer and doctor. He was the first Christian physician on record. Untold thousands have followed in his steps. Physicians can look to Luke as an example. But so can historians, because his writings are very much in the Greek tradition. Painters claim him for their brotherhood, too, because tradition holds he painted a picture of the Blessed Virgin which hung in the Santa Maria Maggiore in Rome. He is considered guardian of all artists, therefore October 18 is celebrated as their professional holiday. Around the year 50 A.D. St. Luke left his activities behind and accompanied St.Paul in popularizing the teachings of Jesus. His contribution to the New Testament is inarguable. Everyone named Louka, Loukan, Zlatka, Zlatko, Zlatimir/a, Zlatyu are having their namedays that day.